Description: Celebrate your child’s growing independence and love of music in this mixed age class for 2 and 3 year olds. Classes are designed to build attention and self-expression and include singing, chanting, moving, focused listening, musical games, exploring musical instruments, creative movement, and storytelling. 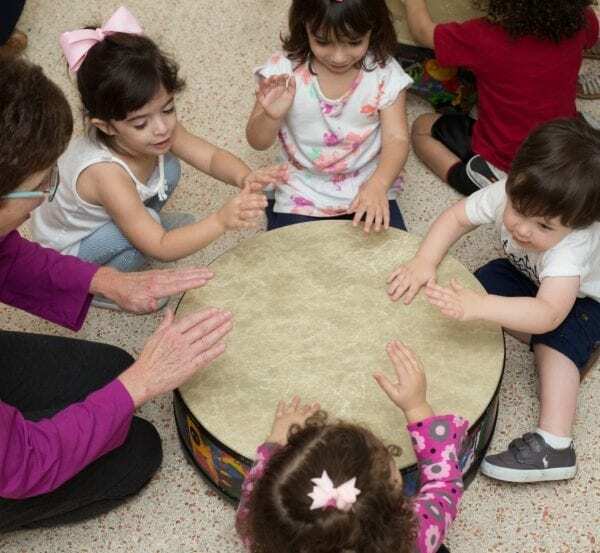 These activities bridge the natural connection between music and movement, while your child’s musical aptitude, listening abilities, and overall potential are enhanced and further developed. Musical Goals: Demonstrate and move in sequences to a steady beat, Encourage independent singing; Apply musical language to rhythm and tonal patterns; Advance listening skills and aural recognition; Play age appropriate instruments; Form a bank of familiar songs. Developmental Goals: Develop gross and fine motor; Advance cognitive and language development; Develop language connections and aural skills; Exhibit independence; Participate in creative/imaginative play; Exhibit body awareness and self-regulation; Strengthen social, emotional, and self-help skills.